Beautifully hand colored map of the Spanish colony Tierra Firme, depicting Lake Cassipa. Partie Occidentale de la Terre Ferme. Par le Sr. Robert de Vaugondy, Fils de Mr. Robert Geog. ord. du Roy. This is a hand colored 1749 Didier Robert de Vaugondy map of Colombia and Venezuela. The map depicts from Panama to Guiana and from the Caribbean Sea to the Equator. The Province of Tierra Firme (Terre Ferme) were the mainland coastal possessions of Spain's New World Empire surrounding the Caribbean Sea. The mythical Cassipa Lake is depicted, near the right border. Cassipa Lake can trace its origins back to the myth of El Dorado and Sir Walter Raleigh. It was said that when Cassipa Lake receded, large deposits of gold would be revealed. Lake Cassipa and another mythical lake, Lake Parima, appeared on many early maps of South America. Through miscommunications with the locals, explorers came to believe that rivers and tributaries were in fact large, fantastic lakes. 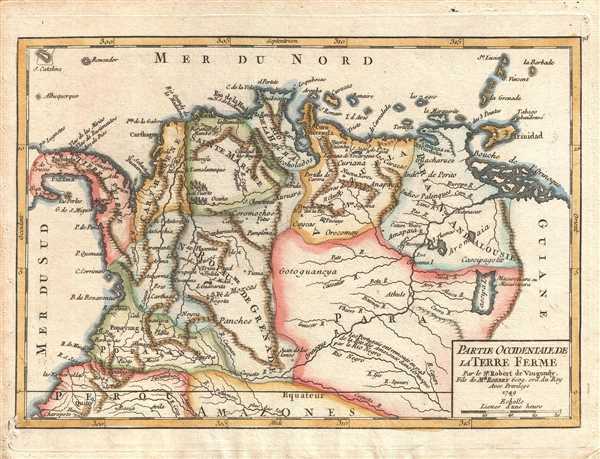 Several of the regions of Tierra Firme on this map are named after regions in Spain, including New Andalousia and the New Kingdom of Grenada. Trinidad and Tobago, St. Lucia, Barbados, St. Vincent and the Grenadines, Curaçao, and several other Caribbean islands are depicted. Myriad rivers, including the Orinoco (Orinoque) are labeled. Numerous towns are also labeled, including Quito, Ecuador and Santa Fe de Bogota, which is now Bogotá, the capital of Colombia. Mountain ranges are depicted in profile. Pedley, M. S., Bel et Utile, p. 217, 488. OCLC 159770325.